We feel proud to introduce ourselves as one of the prominent organizations, engaged in manufacturing and supplying superior quality Super Snow White Quartz Sand Powder in Udaipur, Rajasthan, India. With the valuable assistance of skilled team of professionals, we are engaged in offering an extensive range of high-quality Snow White Quartz Powder. Packaging Size :- 40 Kgs. we have achieved zenith of success because of our supreme quality products. The top notch infrastructure allows us to process and deliver the products to the customers at competitive prices. The facors over which we make no compromise involve quality, crystalline structure and chemical composition of the products. The team is well trained to deal and tackle all kinds of situations and challenges. We are one of the pioneer Manufacturer and Wholesale Traders of Industrial Minerals, Waste Water Treatment Chemical, Earthing Chemicals, etc. These are used in diverse applications and known for their balanced formulation property. 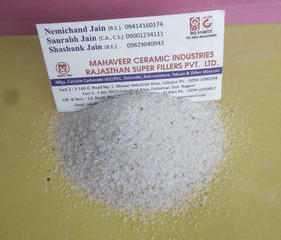 We are among the renowned Manufacturers and Suppliers of Super Snow white Quartz based in Udaipur, Rajasthan. We make available Quartz Powder that is fabricated using the latest technology under the strict quality control measures. Super Snow white Quartz, offered by us, serves various purposes in different industries.